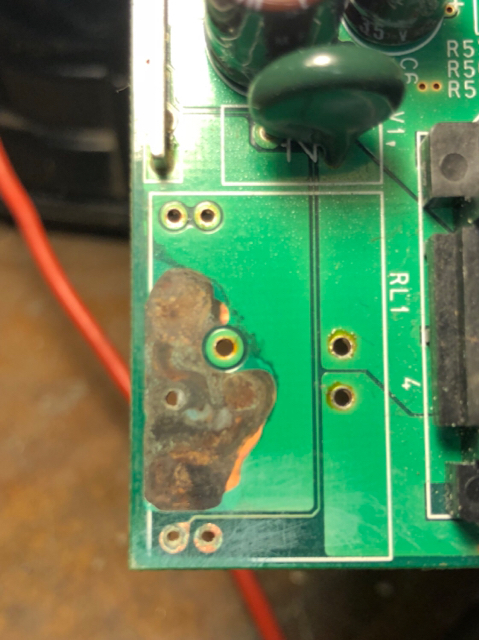 This is the damage to the PCB under the relay. The pad separated from the trace. 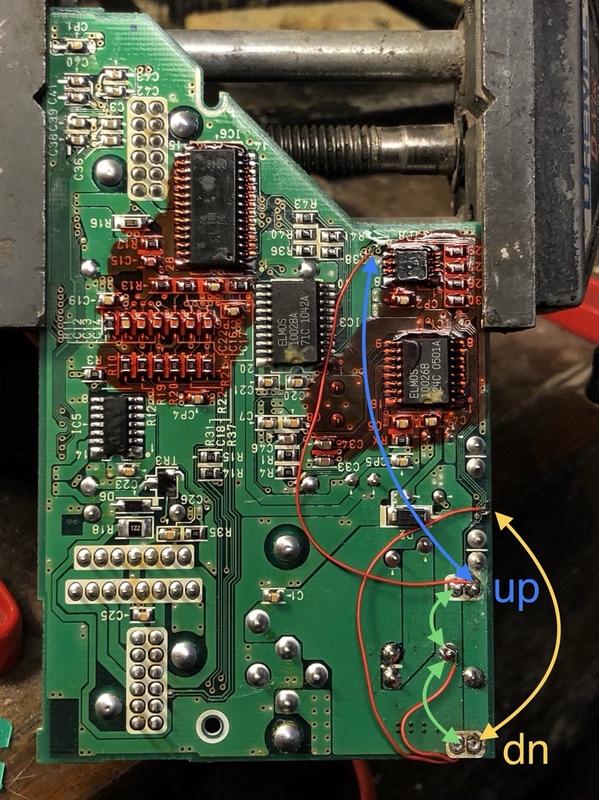 It would not be reliable to repair the trace so jumper is the solution. When I removed the relay two pins were corroded enough they didn't survive. I had to solder jumper wires to the nubs inside the relay. Found the transistors that control the relays on the board topside and traced some convenient jumper points. The best places I found to add jumpers were via holes where the trace goes through the board. In both locations the via is in a set of three and is the middle one. Most people will only have to jumper the down jumper and possibly the ground jumper for the down. (Marked with Green arrow not labeled). Check the points marked with the blue and yellow arrows they should be zero Ω. If they aren't add a jumper wire I recommend 30ga wire wrap wire but 26-28 would probably fit. 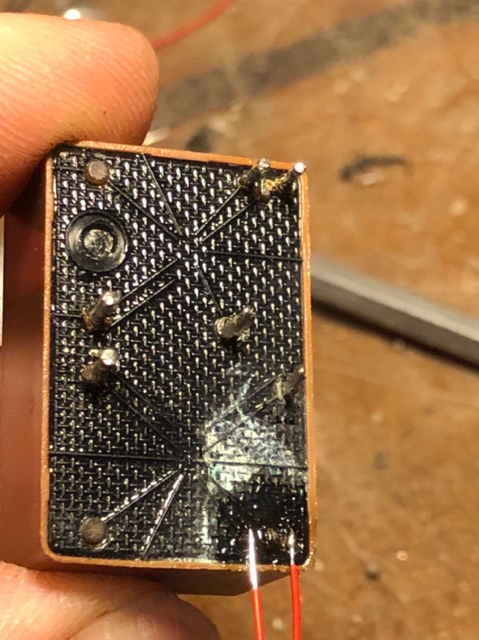 Its easier to poke the wire through and solder from the back side. I have two of these I like to actually fix vs. band-aid when possible. The biggies being the door handle carriers and the taillights. I've also repaired the trunk floor latch that broke but I replaced the plastic broken axle with a steel screw. Dam Andrew this is impressive. What do you do? 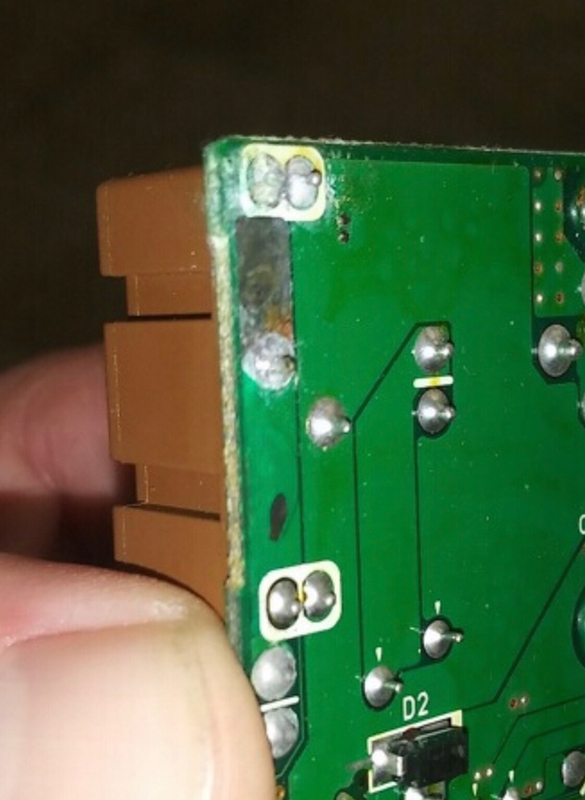 I can try it when I open things up, but this type of electronic repair is totally new to my eye/hand coordinates. Where is this window control module? 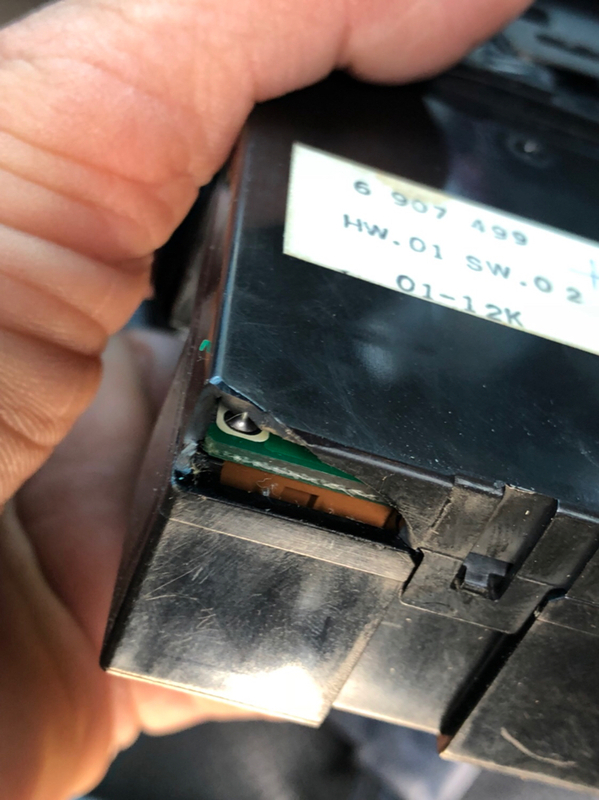 Is it part of the switch housing that is in the door handle? Or is it part of the general module behind/under the dash/glovebox which houses some of the window function relays? It's part of the door switches driver door. It comes right out with a plastic trim tool. Beware a handful of stuff goes through the box so door locks for example won't work properly when it's unplugged. A buddy that had the same problem found his old switch and took a picture yesterday. This is what it typically looks like. I charged him $50 to repair the switch. You can. Try to buy a used one but that's what he did and just bought another with the same problem. Apparently a lot of previous X5 owners use driver through without awning or something. Cut a hole to let water drain out. I did this with both mine and wife's X5 preemptively when I had the door apart for lock or handle repair. FYI; the repair I did managed to break itself from vibration, I walked the guy through fixing it via text message and phone; he re-attached the jumper wire by drilling out the hole where the relay pin broke off, and used a tiny screw from an old broken phone to screw through into the 'nub' on the bottom of the relay. That won't be necessary for most people. 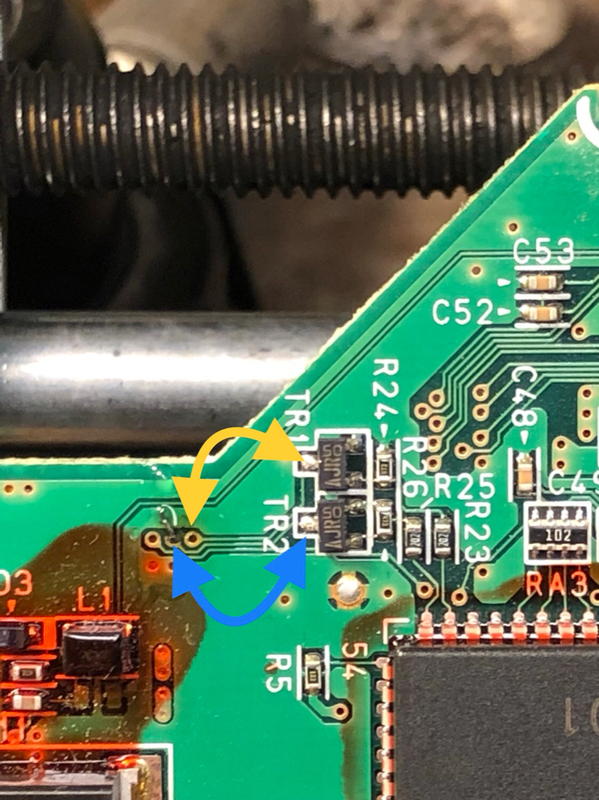 leave the relay on; you won't break the pin off unless you remove the relay; I use 30ga wire because i always have some on hand and it fits through the vias on the board, but you can solder to the leg of the two transistors, but you have to be very careful not to overheat them so do it quickly. 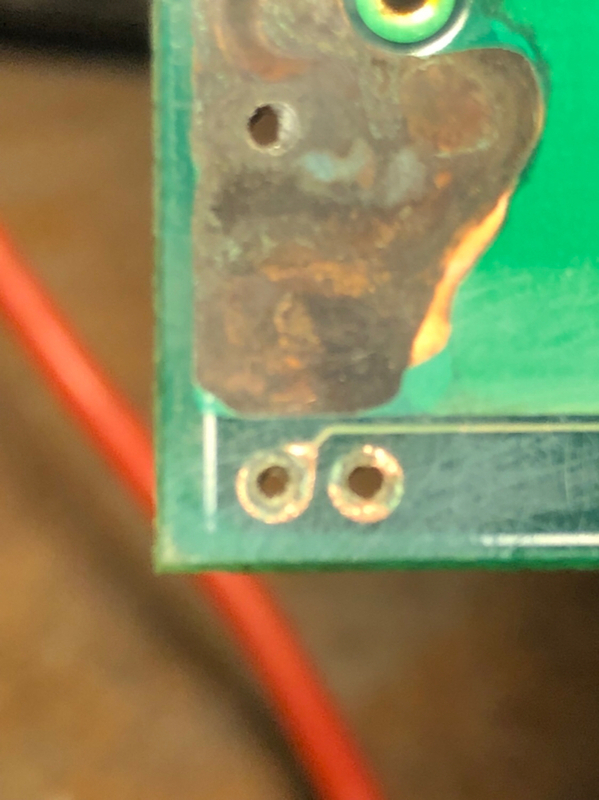 My buddy with zero soldering experience re-soldered the down jumper to the via on the edge of the board with a crude soldering pencil, so anybody can do this repair. The up is more difficult but that's usually still operational. 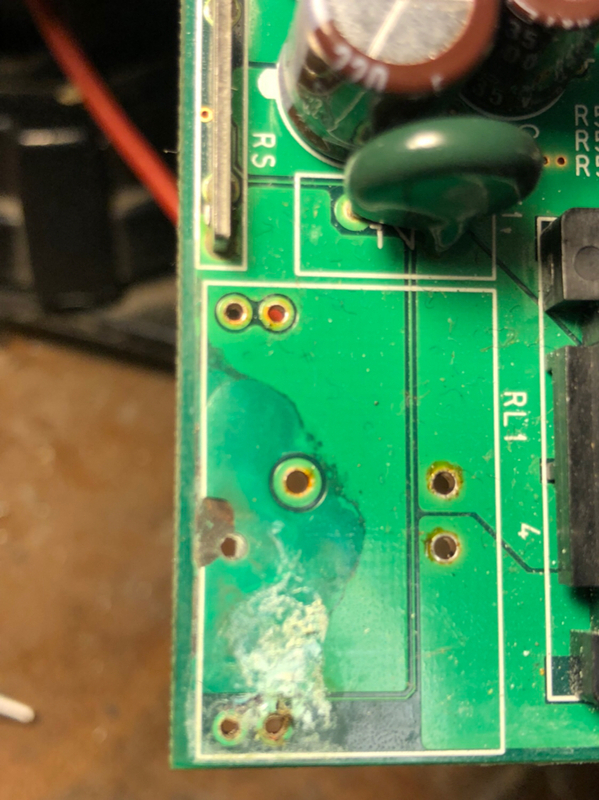 take note of the oversight on BMWs part; they weather sealed about 1/3 of the circuit board with the red epoxy but didn't do the bottom corner where water can actually puddle. oops.